Economist Edward Yardeni uses the word selfie to describe single people who can spend money on themselves or save for later because they're not supporting a family, saving for college, or paying off a mortgage. Bloomberg.com recently quoted Yardeni in a story about selfies and reported that this segment of the population is 125 million strong and has $2 trillion in buying power, making it a coveted market. Because many selfies rent, major appliances and home improvement items don't appeal to them. They will spring for fancy coffee makers and floor cleaning appliances. Electronics are always a necessity for younger selfies who don't mind spending for the latest upgrades. Adventurous selfies who travel can find a wide variety of options. Travel, resort, and hotel companies are targeting selfies by offering themed cruises, destinations, and travel packages designed for selfies of all ages. Where can you find selfies in the United States? Pockets of them live in densely populated urban areas such as Washington, DC; New York City; and Chicago—places where young people often move to find work. Selfies are also found in places such as Sumter County, Florida, where many senior citizens live in one-person households. 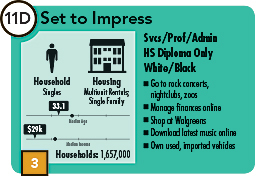 Esri's Tapestry Segmentation data includes several segments of one-person households. Many in these neighborhoods are Millennials—young, diverse, well educated, and either finishing their education or working. They rent and live alone or share a place in densely populated areas of large metros in the South, West, and Midwest. They can't do without their cell phones. They are not brand loyal and shop for the best price. They buy natural/organic food but will also buy fast food. They go online to bank, buy from eBay, access Twitter and Facebook, and watch TV and movies. 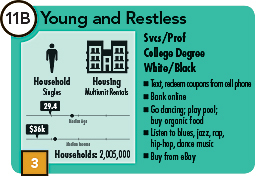 Residents are young—either still in college or working—and rent apartments in large multiunit buildings in the city or suburbs. Many live alone but keep in close touch with family. Most have a cell phone. They're very image conscious and often buy clothes impulsively to look good. They're really into music—they listen to and download a variety of the latest music and know about their local music scene. 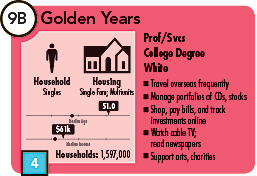 These young, educated singles live life to the fullest and are not ready to settle down. 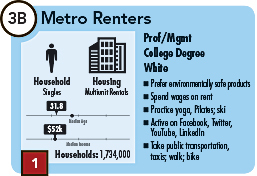 They have good jobs and spend their disposable income on upscale city living (mostly on rent) and entertainment. They're connected at all times. Texting and social media are essential for this group. They prefer e-readers and tablets for everything except women's fashion and epicurean magazines. They shop at Whole Foods and Trader Joe's. Metro Renters are young, mobile, and educated. Many are still in college. They live alone or with a roommate in rented apartments or condos in city centers. 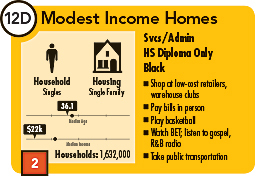 Most of their income is spent on rent, fashion, and the latest technology. They use their cell phones and computers every day. They buy groceries at Whole Foods and Trader Joe's and shop for clothes at stores such as Banana Republic, Nordstrom, and Gap. 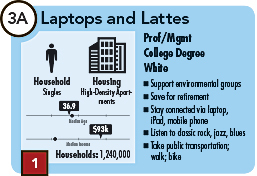 These affluent, well-educated singles love life in the big city and hold professional jobs. 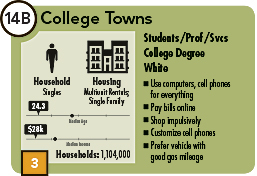 Most don't own a home or vehicle. They rent apartments close to amenities. They invest in mutual funds and contribute to retirement plans. Regular expenses include nice clothes, travel, lattes at Starbucks, organic food at high-end grocers, or treatments at spas. To stay connected, their laptops, cell phones, and iPads are always on. 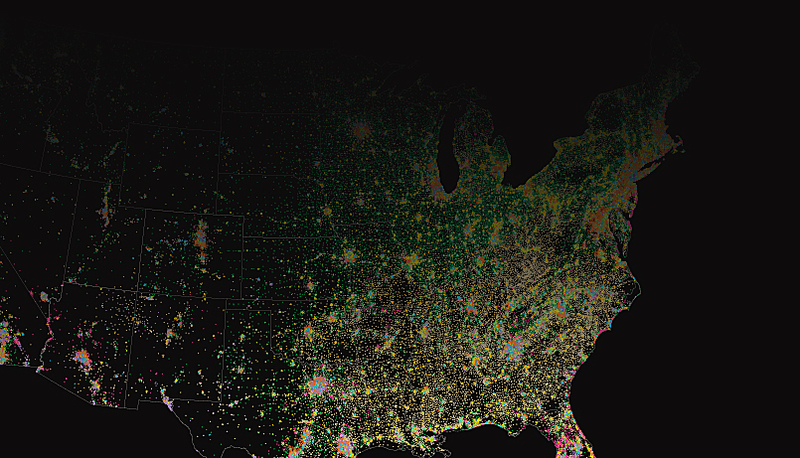 Religious faith and family values guide the people who live in these neighborhoods. Many residents are primary caregivers for elderly relatives. Jobs are often hard to find, so Social Security, public assistance, and Medicaid help them to scrape by. They don't use credit cards and prefer to pay bills in person. They play basketball, watch a lot of TV, and buy products endorsed by celebrities. 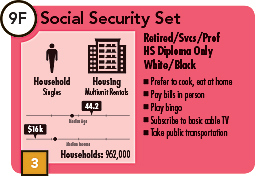 These senior citizens live alone on low, fixed incomes. 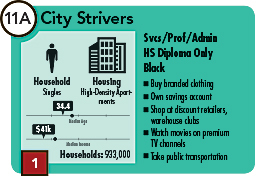 They reside in low-cost apartments in high-rise buildings near heavily traveled urban business districts. Wages and salaries provide income for those who are still working. Social Security, Supplemental Security Income, and public assistance provide support for others. Low incomes limit shopping, so they're very careful spenders. They're technology averse. Cable TV and bingo provide most of their entertainment. Want to learn more about all of Tapestry's segments? Esri's Tapestry Segmentation data (available at multiple levels of geography in maps, in reports, online, and in software) contains detailed lifestyle information about every US neighborhood.